One of the great pleasures of following book blogs is discovering books that it wouldn’t otherwise have occurred to you to read. As you get older, you can get a little set in your reading habits, only choosing books that you already know that you will like. 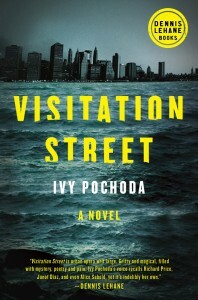 So I probably wouldn’t have read Ivy Pochoda’s Visitation Street if I hadn’t read a review by my good blogging friend, Moira, at Clothes in Books – http://bit.ly/1BuDYr8 – and decided I’d try it. It took me a while to get into it – I don’t generally like books written in the first tense – but once I did, I was hooked. There is some wonderful writing here – the description of Val’s teenage crush is typical of the way Pochoda captures the state of mind of her characters. It begins one night in Brooklyn during a heat wave. Val and June are fifteen and longing for adventure. They set off on a pink rubber raft, meaning to float along the shore. They have no idea how cold the water is or how strong the current. In the morning Val is discovered still alive, but unconscious, under the pier. What has become of June and how can this multi-racial community come to terms with her loss? That is the thread that runs through the novel, tying together a vividly realised cast of characters. There was a warmth in her treatment of them and I loved the sense of place. By the time I’d finished, I almost felt I could walk the streets of Red Hook myself, drop off for a coffee and pastry at Fadi’s bodega, watch the drunks staggering out of Lil’s Dockyard Bar, gaze over the bay at Manhattan sky-line. Love this review and am anxious to read it all. (You do make the best recommendations, you know.) Thank you! Thank you, Annie! I did think it was very good. Hope all is well with you.